In its second year, Frost Fest is the Northalsted Winter Warm-up! This two-day winter party is the cure for anyone’s cabin fever, with activities for everyone! 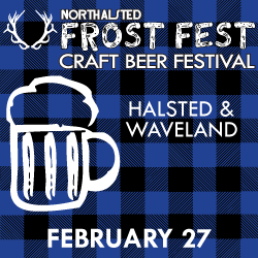 Frost Fest boasts Lakeview’s largest craft beer festival on Saturday, February 27th featuring 41 local brewers serving their most famous craft beers in a 5,000 square foot HEATED tent! 2,000 attendees can sample up to 15 beers at one of two tasting sessions. Guests will dance the afternoon away with live music and warm treats from various food trucks! Each ticket includes: one wristband for entry to restricted access tasting area, (15) 3-oz tasting tickets, and one souvenir tasting glass. The first tasting session is from 1:00PM-4:00PM on Saturday, February 27th. *Must be 21 years of age or older with valid ID to redeem. All sales are final. Admission and tickets are session-specific and are non-transferable. Tickets may not be shared. Unused tickets may not be returned or redeemed for cash back. Get your tickets here. This entry was posted in Community News and tagged festivals on February 18, 2016 by elvn_updates.